Tánisi! Quinton Delorme nitisinihkáson. I’m an Ininiw, Two-Spirit helper from Turtle Island and my adopted spirit name is The One Who Is Pure. My involvement with Aboriginal Youth Opportunities has allowed me to help organize many “Meet Me @ the Bell Tower” events, engage in AYO Politix brainstorms, and speak on behalf of AYO! at conferences across Canada. My biggest achievement with AYO! is founding & coordinating Speak Cree!, a weekly intergenerational Cree language gathering in the St. John’s neighbourhood of Winnipeg. I am very proud to represent the youth of Winnipeg’s North End on the Board of Directors at the North End Community Renewal Cooperation. At a local restaurant I serve tables (and serve looks), as well as Barista. I’m an Aquarius sun and Capricorn rising, I love to sing, and I drink way too much coffee. Ékosani! Hello! My name is Niamh Dooley and I am an Oji-Cree and Irish contemporary artist based in Winnipeg. I am a band member of St. Theresa Point First Nation in Treaty 5 territory of Manitoba, but grew up in Treaty 3 territory in Sioux Lookout, Ontario. I graduated in 2017 from the University of Manitoba Bachelor of Fine Arts (Honours) program and currently seeking a second degree for my Bachelor’s of Arts majoring in Native Studies and minoring in Art History. I am looking forward to help with the mission of reconciliation and decolonization within the communities I’m involved in and our nation as a whole through this organization. I hope to bring my art background to help with this mission and reach the Indigenous and non-Indigenous youth of the community. Tansi, My spirit name is Silver Morning Otter Woman, I belong to the turtle clan. I am from Nisichawayasihk Cree Nation, Treaty 5 territory, in Northern Manitoba. My grandparents are L. Gail Gossfeld-McDonald and Jeromia McDonald. I am the oldest of 9 siblings and am an auntie to several gorgeous nieces and nephews. I currently live in Winnipeg, Manitoba and I work as an Administrative Assistant for Clear Sky Connections which is a non-profit, Indigenous organization that is in the process of building Manitoba’s Network of the Future by connecting all First Nations with a high-speed fiber optic network. I am very passionate about education and health, I carry a lot of love for my community, family and our nehetho culture/traditions. I am interested in a career with project management and am an active learner. I believe that my purpose is to be the medicine to aid our people in healing, being true to their own identities, and to see a hopeful future by showing by example and teaching kindness, resiliency and respect. I am grateful for each day and every opportunity that arises. 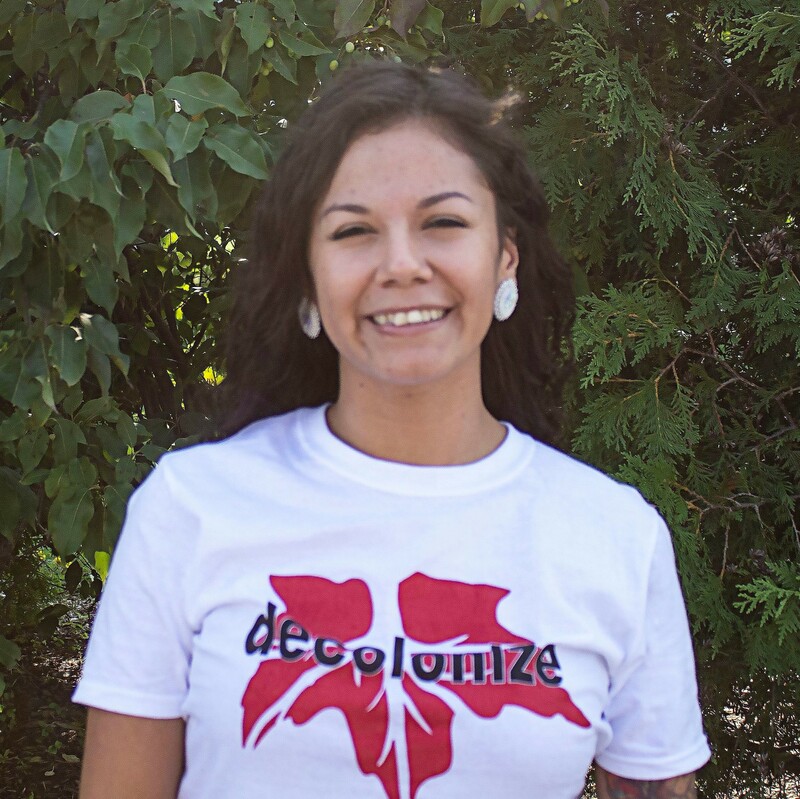 As a Youth Leader for YRI, I will work hard for understanding of/and on reconciliation to the best of my abilities so that I am able to share my knowledge with all of my relations and to improve the quality of life for younger generations. Samantha Harris is first and foremost a mother to her beautiful 2 year old son. Samantha was born on treaty one territory, winnipeg Manitoba, but spent much of her childhood moving around in the United states. She is currently working towards her Bachelor of Social Work, and holds a diploma in Addictions and Community Service Work. She has spent the last 6 years dedicating her time and energy to working with at risk youth. She is currently a supervisor at the Strong Hearted Buffalo Women Crisis Stabilization Unit, working with youth who are at risk of, or currently being sexually exploited. This has sparked her passion in providing safety and security to those who need it most. Samantha was a co-organizer of Winnipeg’s first Slutwalk, tackling the issue of victim blaming and sexual violence. Samantha is excited to share her knowledge and experience to work towards understanding and recognizing the paths each person brings with them. I was born and raised in Kaslo, British Columbia, a small town that is located on the unceded land of the Sinixt Nation. I moved to Winnipeg three years ago to pursue my educational interest in community development and am currently studying at the University of Winnipeg in the Urban and Inner City Studies program. I have worked and volunteered at a few community-based organizations, and am an active member of the Social Justice Group at the First Unitarian Universalist Church of Winnipeg. By being part of the Youth Reconciliation Initiative (YRI) I hope to both broaden and deepen my understanding of reconciliation by hearing a variety of new perspectives, and learn how to incorporate those views into building stronger communities in Winnipeg. Toryan McCorrister is from Peguis First Nation Treaty One Territory. He is a graduate of Red River College from the Self Government Program. Also a 2nd year student at University of Winnipeg taking indigenous governance. In addition he is part of Aboriginal Youth opportunities also known as AYO. 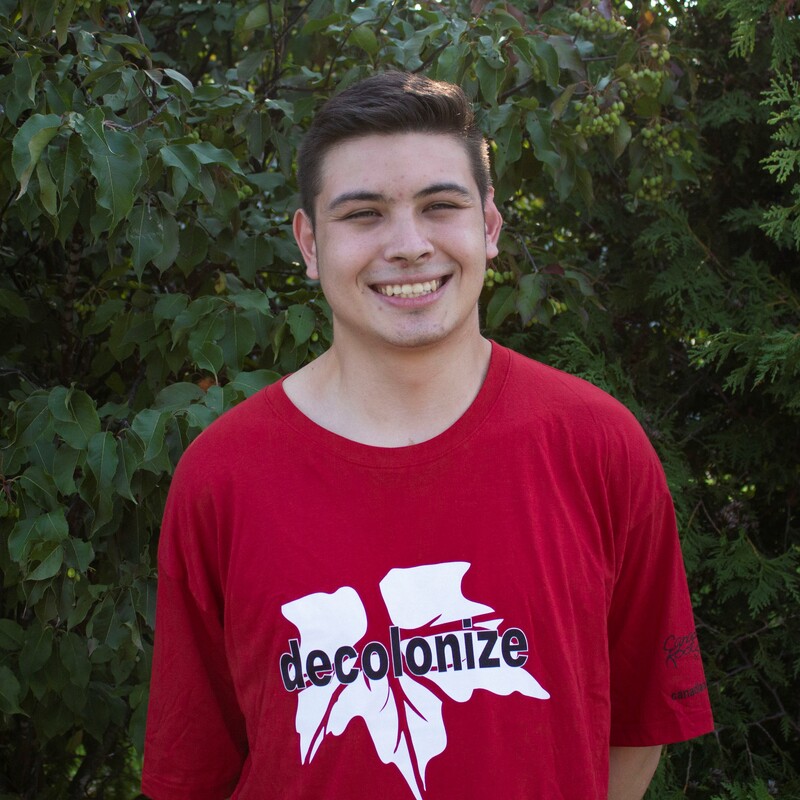 Toryan is honoured to take on the responsibility of being Youth Chief of the SCO region. He strives and enjoys being in the front lines advocating for youth priorities on and off reservations.